Seventy-nine years ago today in the early morning darkness, the Allied Navies – Canadian, British and American- assembled a huge armada to invade occupied France. Although victorious, by day’s end, 9,000 Allied soldiers were killed or wounded, protecting the rights and freedom we enjoy today. We remember these heroes, yet we tend to lose sight of the heroes in our midst. A grassroots movement that began eight years ago is changing that. Red Shirt Friday continues to grow as Canadians and Americans remember those who have died in service to our countries. It’s one simple and visible way to express gratitude, show support and let the men and women who serve in our Armed Forces know they are not forgotten. As much as we communicate now at lightening speed, the lives we take for granted are far removed from the actions of those who protect them. Unless we have friends or family serving, it’s easy to lose touch with what they’re doing. Until I got to know veterans riding groups like the CAV (Canadian Army Veterans), I was keenly unaware of the rigors that are routine with military service or the effects that linger long after returning home. One Canadian whose personal mission is to make sure we won’t forget is Lise Charron. Looking for a cause to put her energy behind, Lise was deeply touched by the 2009 death of hometown soldier Jack Bouthillier while serving with NATO forces in Afghanistan. Driven by a desire to raise awareness of our troops and their missions, fueled by compassion and filled with gratitude, Lise organized a commemorative motorcycle ride in Hearst, ON, Bouthillier’s home town. 12 riders showed up but it was a start. About the same number participated in Victoriaville, QC, in September where although no one had died, one son was in the reserves about to be posted to Afghanistan. 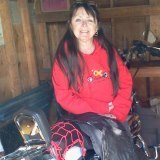 The following year, she organized the first annual Ride in Red to the Bikes in the Bay Rally in Campbell’s Bay QC, starting a tradition that occurs on the second Saturday in June – this weekend. Lise was also instrumental in getting people to line overpasses beneath which repatriated soldiers journeyed on their final ride home. In 2011, she started a Facebook page – Honour Our Canadian Soldiers, posting pictures of fallen soldiers who served in Afghanistan on the anniversary of their passing. Her latest goal is to establish a monument in the hometown of each of these soldiers. Lise carries Red Shirt Friday beyond it’s original intent by wearing red to every military event, no matter what day of the week. If one person can create this much momentum, think of what can happen when we all pitch in. There are many ways to show your respect and gratitude to the men and women serving in our armed forces. Start by wearing a red shirt tomorrow. Visit either the US Red Shirt Fridays organization or the Canada’s Red Friday not-for-profit organizations for other ideas. It’s the least we can do. To those of you who are serving or have served, or have loved ones that are serving, thank you for the sacrifices you have made and continue to make for all of us. To the rest of us, let’s make sure they know they’re appreciated by wearing a red shirt every Friday. What a woman I am inspired. I will wear Red on Friday’s. Thank you Liz for bringing her story to us. My honor Mary. I have just scratched the surface with Lise’s story. She’s a force to be reckoned with and highly regarded by military, veterans and their families.